Here’s the most revolutionary, most useful truck accessory to come along in decades. A combination step platform and seat that spans the entire width of the tailgates of standard size pickups. Does not fit small pickups such as Ford Rangers, Chevy S-10's, etc. 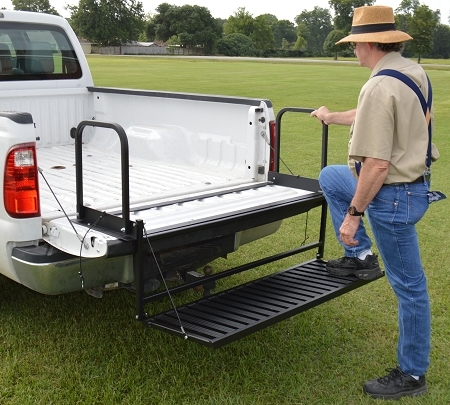 The Truck N’ Buddy Magnum basically reinvents the tailgate and genuinely adds a whole new dimension of usefulness and convenience to a pickup truck. 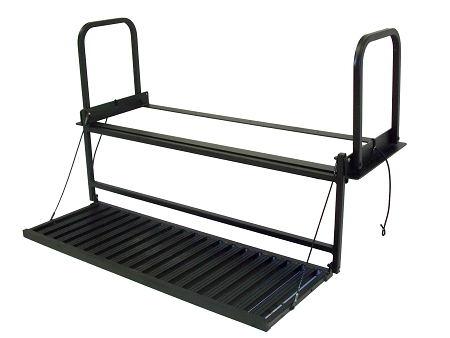 No more straining to climb into the bed of your truck, walk into it as if walking up steps. No more searching for a seat at a job site or in the outdoors, if you’ve got your truck, you’ve got a seat. For those who make a living with their trucks, the Truck N’ Buddy Magnum saves time and labor dollars, provides quick and easy access to tool boxes and materials, provides a comfortable work seat, literally transforming a truck into a mobile work station. The Truck N’ Buddy Magnum stows compactly on the tailgate and never interferes with storing and hauling cargo in the truck bed. For campers and “tailgaters”, the Truck N’ Buddy Magnum is awesome! No need for taking up valuable space with camp chairs---just drop the tailgate and have a seat! Squeeze your pickup into a tight spot and get cooking! The Truck N’ Buddy Magnum is constructed of aircraft aluminum and weighs only 29 pounds; is finished in super-tough black powder-coat enamel. It attaches quickly and easily with 14 metal screws and provides two handy grab-rails to insure safe entrance and exit. The platform is supported by two cables two industrial cables giving the Truck N’ Buddy Magnum an overall distributed weight limit of 400 pounds and can ship UPS.